FIREFLY is a chi-squared minimisation fitting code for deriving the stellar population properties of stellar systems, be these observed galaxy or star cluster spectra, or model spectra from simulations. FIREFLY fits combinations of single-burst stellar population models to spectroscopic data, following an iterative best-fitting process controlled by the Bayesian Information Criterion. No priors are applied, rather all solutions within a statistical cut are retained with their weight, which is arbitrary. Moreover, no additive or multiplicative polynomia are employed to adjust the spectral shape and no regularization is imposed. This fitting freedom allows one to map out the effect of intrinsic spectral energy distribution (SED) degeneracies, such as age, metallicity, dust reddening on stellar population properties, and to quantify the effect of varying input model components on such properties. Dust attenuation is included using a new procedure, which employs a High-Pass Filter (HPF) in order to rectify the continuum before fitting. The returned attenuation array is then matched to known analytical approximations to return an E(B-V) value. This procedure allows for removal of large scale modes of the spectrum associated with dust and/or poor flux calibration. The fitting method has been extensively tested with a comprehensive suite of mock galaxies, real galaxies from the Sloan Digital Sky Survey and Milky Way globular clusters. The robustness of the derived properties was assessed as a function of signal-to-noise ratio and adopted wavelength range. FIREFLY is able to recover age, metallicity, stellar mass and even the star formation history remarkably well down to a S/N~5, for moderately dusty systems. FIREFLY provides light- and mass-weighted stellar population properties – age, metallicity, E(B-V), stellar mass and its partition in remnants (white dwarfs, neutron stars, black-holes) – for the best fitting model and its components. The star formation rates for the individual components are given, the total past average can be easily obtained from the provided quantities. The star formation history can be easily derived by plotting the SSP contributions with their weights. Errors on these properties are obtained by the likelihood of solutions within the statistical cut. The code can in principle fit any model to any spectrum at any spectral resolution and over any wavelength range. At present, the code has been applied to spectra from SDSS, integrated and from Integral field Unit (MANGA), the DEEP2 survey and globular clusters from various sources. We make available customised models that are already matched to the spectral resolution of these datasets. The suite of possibilities will increase through the use of the code with different empirical or simulated datasets. A full description of the code and results of the extensive testing is in Wilkinson et al. 2017. At this webpage you can download the code and several additional files, plus the galaxy calculations that have been already performed. 1. Code and ancillary files. Download the Firefly code, readme and ancillary files from the dedicated GitHub repository or as a zipped file. Download the input stellar population models and mass loss files. SDSS DR12 galaxy properties, i.e. age, metallicity, dust, both light and mass-weighted, stellar mass, and its components in remnants, plus 1,2,3 sigma errors, for three option models, M11-MILES, M11-STELIB, M11-ELODIE, and three initial mass functions (IMFs) – Salpeter, Kroupa and Chabrier – for each of the models. Available from the University of Portsmouth Globus Endpoint, see instructions below. 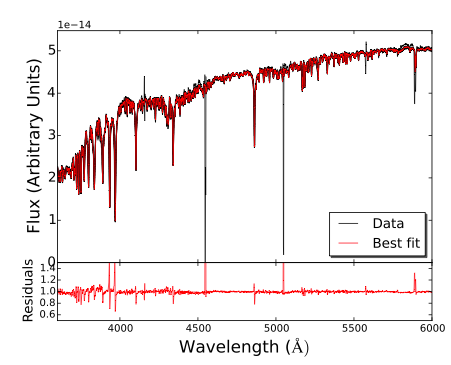 DEEP2 – DEEP2 spectra was fitted in a similar way to SDSS DR12. Derived parameters and information can be found in the DEEP2 fits file (340 Mb) and accompanying README file, but also through the University of Portsmouth Globus Endpoint, see instructions below. 1) Create a Globus account on Globus.org. 2) Create either a local Globus Endpoint on your laptop (if you wish to transfer small amounts of data) or use your host affiliations Endpoint (for the whole data sample). Most Universities will have one of these set up already, if not speak to your system administrator. See also instructions on the Globus web page. Once logged in, you can transfer data from this location to your own endpoint. 5) An automatic email will confirm when the data has been successfully transferred.